Before the problem with their flooring from all the heavy foot traffic, if you had asked the management at River Creek Medical Center what the most rewarding aspect of their business is, they would say, without hesitation, that it’s the ability to work with and help so many people each and every day. There are consequences to dealing with so many people, though. You see, their halls are always bustling with activity – and we’re not just talking foot traffic here either, oh no. There are wheelchairs, and crutches, and stretchers to contend with as well, and over the years they’ve all come together to leave large marks on the medical center’s vinyl floors. At first, management figured that they could just cover the worst parts up with some fancy area rugs, which worked about as well as applying a bandage to a wound that requires stitches. Suffice it to say, the damage still bled through and their efforts only made it painfully obvious that something was amiss. 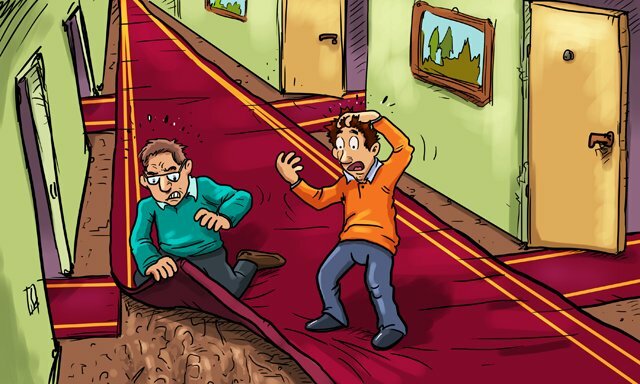 There were talks about renovations, sure, but the immediate cost of a few extra rugs just seemed so much more manageable than what they were being quoted by local flooring companies. In the end, they convinced themselves not to worry. Besides, they dealt in medicine, not interior design; what did it matter, really, if their floors were a little less than beautiful? A year later, their renovation budget is now twice in the hole thanks to the cost of the rugs. Staff and patients often share whispered stories of what exists beneath them, and it’s a passing joke that if the floor gets any worse they might just find themselves tripping over holes of a different breed.